Savour the spices of Morocco with this succulent stuffed aubergine recipe. Filled with a spiced cous cous and served with a fresh cucumber and tomato salsa salad, this makes an easy vegan, vegetarian and dairy-free midweek meal. Preheat the oven to gas 7, 220°C, fan 200°C. Deeply score the flesh of the cut sides of the aubergines in a criss-cross pattern, going down to but not through the skin. Brush 2 tsp oil over the scored surface. Put in a large roasting tray and roast for 30 mins. Meanwhile, put the couscous, ras el hanout and 200ml (7fl oz) boiling water in a large bowl. Stir, cover and set aside for 10 mins. Add the mint leaves to the couscous; mix. Meanwhile, mix the cucumber, tomatoes, red onion and most of the parsley in a serving bowl. Remove the cooked aubergines from the oven and leave to cool for a few minutes. Preheat the grill to the highest setting. Use a metal spoon to carefully scoop the flesh from the aubergine halves, leaving the skin intact. Put the skins back on the tray then roughly chop the esh and mix into the couscous. Spoon the mix into the skins then drizzle with the remaining oil. Grill for 3-4 mins, to crisp the top. 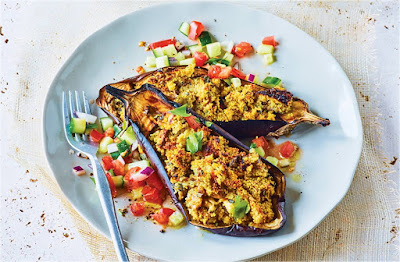 Serve two roasted aubergine halves per person, scattered with the remaining parsley and the salad alongside.